High quality reproduction in the style of the Tolix Style Chair - Xavier Pauchard. 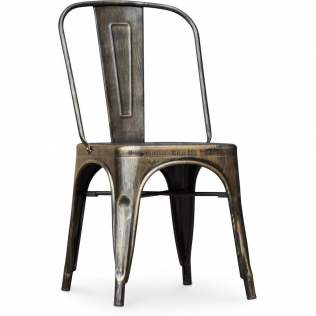 The Tolix Style chair inspired by the original design of the prestigious designer Xavier Pauchard is made of steel and it is perfect to give your interior an industrial touch. This metal chair has a perfect straight seat to place a cushion and a slightly sloping back for better posture. The Tolix chair is ideal for improving the look of your room, kitchen, bedroom ... Thanks to the variety of colors available you can choose the one that matches your decor. If you are looking for a chair that provides character and an industrial touch to your home do not hesitate, the Tolix chair Xavier Pauchar is your best choice. Today, does it again with this Tolix Chair Xavier Pauchard Style - Metal.We are helping to bring you design products that cannot be found elsewhere at cost prices directly from factories in Asia. Our team is always on the lookout for unique, top quality products and we are stepping up our efforts to bring you choice and quality at cost prices, products that will charm you with their design, their originality and their price!